In response to a previous post, a reader inquired what kids’ art supplies we keep on hand. We can’t keep a huge variety of fancy art materials at home since everything must fit in one small cupboard (closet space is at a premium in this city!) and one bin in the basement. There is nothing particularly original or innovative about this list. It is just what works for us. Tempera Paint. Get washable! You really only need 5 colors: red, blue, yellow, white and black. Note: this is not archival quality paint, head down to your local art store if you need that. Liquid Watercolor . This may seem exotic, but they are very useful. We use them for coloring playdough, making marbelized paper, dropping on absorbent paper, etc. You can also mix them with water in a spray bottle for some (outdoor) fun. They are better than the traditional watercolor palette because the colors don’t get muddy and you can control how many colors you present at one time. Markers, crayons, inexpensive oil pastels. Susan Striker recommends taking the paper off so the child is not limited to only using the end for drawing. We also love Watercolor Crayons and Watercolor Color Pencils . Collage materials. You don’t actually have to buy these. Use bits of wrapping paper, junk mail, ribbons, buttons, beans. Anything that comes your way. It’s fun to let the kids find their own. They feel more ownership that way, too. Painting implements. A variety of brushes and rollers. I mostly cheap ones but have a few quality ones, too, especially watercolor brushes. The foam paint rollers are fun. Also check out the hardware store for cheap foam brushes in a variety of sizes. You can also use found objects around the home for printing. As Kiddo has gotten older, I’ve invested in some good quality brushes from the art store down the street, but New Kid still gets the cheap ones. Office supply stickers. I’ve written many times about the joys of office supply stickers. They are versatile and low tack for kids who might like to stick them all over the house. (Not that I know anything about that!) Recently we used them for making Toddler Dot to Dots, which is one of this blog’s most popular posts. Paper. Colored construction (if you can, buy the better quality… unless you want to make sun prints), real watercolor paper (useful for very wet painting fun) and plain painting paper. When I was a kid, my mom used to get free rolls of plain newsprint paper at the local newspaper. I have no idea if this is still a practice anywhere, but you could inquire. Glitter Glue . Oh, the joys. White Glue. Buy a large jar and decant it, so you don’t produce as much packaging waste. Scissors. Fiskars brand are the best I’ve found. We can’t keep much more than this around here, although we do have the odd unusual material, like colored cellophane , which we used for our faux stained glass windows. Obviously there are a lot of found objects around the house that could be used for art in creative ways: bubble wrap, egg cartons, cardboard rolls and tubes, etc. I like to figure out how we can use items that are normally headed towards the trash or recycling. Take out containers are especially useful as paint trays. It sounds like a lot once I write it all down, but it all fits in our small cupboard! For the amount of art my daughter actually does we have way-way-way too much art supplies. One small cupboard would be sufficient, maybe then I would be able to restrain myself from buying more stuff. 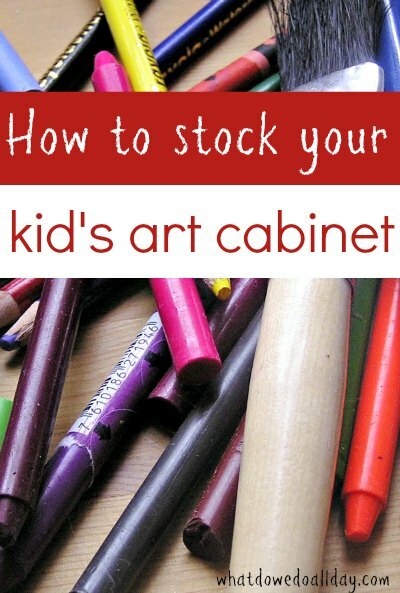 We have what you have but we also have what my kids call “crayon-markers”: http://www.amazon.com/Crayola-12ct-Twistables-Slick-Stix/dp/B001F37LQW/ref=sr_1_1?ie=UTF8&qid=1319834442&sr=8-1. THey are kind of like cray-pas. THey are very satisfying because the lightest touch makes a very bright mark but that same quality also makes them useless for anything more subtle. I agree with you on that Fiskars makes the best children's scissors! I didn't know about this website – thanks for the recommendation. What a helpful list! I would also love to see how you store these materials! Thanks!